Ma Long and Wang Manyu won the respective men’s singles and women’s singles titles at the Seamaster 2019 ITTF World Tour Platinum Qatar Open in Doha on Sunday 31st March; thus closing the curtain on a tournament which clearly underlined the fact that China is more than well prepared for the forthcoming Liebherr 2019 World Championships in Budapest. The successes added to those of the previous day. In the mixed doubles event Xu Xin and Liu Shiwen had prevailed, in the women’s doubles Wang Manyu had also enjoyed the taste of victory, partnering Sun Yingsha to gold. The one title that did not finish in Chinese national team hands was the men’s doubles; that went to the Special Administrative Region, Hong Kong’s Ho Kwan Kit and Wong Chun Ting emerged the victors. Eyes focused on Ma Long; how would he react after some seven months away from international limelight? He answered in glowing fashion. After a somewhat indifferent start, beating Frenchman Tristan Flore in six games (6-11, 11-5, 12-10, 9-11, 11-5, 11-7), he pressed the accelerator. The no.11 seed, he overcame Germany’s Timo Boll, the no.4 seed, in straight games (12-10, 11-7, 11-4, 11-8), followed by success against Japan’s Jun Mizutani, the no.9 seed, in a similar fashion (11-2, 11-6, 11-6, 15-13) to reserve his place in the semi-finals. Colleague Xu Xin, the top seed awaited, a six games win was recorded (12-14, 11-6, 11-8, 12-10, 11-7, 11-6), before one day later facing a further compatriot, in the likes of Lin Gaoyuan, the no.2 seed, a similar margin of victory was secured (9-11, 8-11, 11-5, 11-5, 11-9, 11-9). The win meant, having previously succeeded in 2013, 2016 and 2017, Ma Long had won the Qatar title four times; he moves ahead of colleagues Wang Liqin and Xu Xin in addition to Zoran Primorac who each prevailed on three occasions. Furthermore, it meant he also secured his 27 ITTF World Tour men’s singles title; he equals the record of Vladimir Samsonov of Belarus but it must be borne in mind that always Ma Long has won when the might of China has been present. In addition, he has prevailed at the Grand Finals on five occasions; for Vladimir Samsonov it is just once at the prestigious end of year tournament in 1997 in Hong Kong when Ma Long was nine years old. Defeat at the final hurdle for Lin Gaoyuan but there was a plus factor, previously in close duels too often he had fallen short. At both the quarter-final and semi-final stages he survived testing examinations; in the round of the last eight he ended the progress of Chinese Taipei’s 17 year old Lin Yun-Ju (14-12, 10-12, 11-6, 12-10, 9-11, 11-8), before halting the advance of Sweden’s Mattias Falck, the no.12 seed (14-12, 10-12, 11-6, 12-10, 9-11, 11-9). A man in form, one round earlier, Mattias Falck had beaten Japan’s Tomokazu Harimoto, the no.3 seed (11-8, 9-11, 11-1, 11-6, 8-11, 3-11, 11-5), the second round winner in opposition to China’s Liang Jingkun, the no.15 seed (12-10, 11-8, 11-8, 11-8) and also Budapest bound. Meanwhile in the women’s singles event, for Wang Manyu it was sweet revenge; one year ago she had been beaten by Liu Shiwen in the final; this year she turned the tables. After a stunning victory in opposition to colleague Ding Ning, the top seed, occupying the no.4 seeded spot she beat her compatriot, the no.3 seed, in six games (11-3, 10-12, 12-10, 11-6, 5-11, 11-5) to arrest the title. Notably, at the quarter-final stage, Ding Ning had ended Japanese hopes by beating Mima Ito, the no.5 seed (12-10, 12-10, 11-4, 11-8), the player against whom she suffered defeat in early November at the Seamaster 2018 ITTF World Tour Swedish Open. A fine effort from Wang Manyu, sounding warnings to the established guard; it was the same from colleague Sun Yingsha. In the opening round she accounted for Japan’s Ksasumi Ishikawa, the no.2 seed (11-7, 11-9, 14-12, 11-5), before in the penultimate round extending Liu Shiwen the full seven games distance (5-11, 11-6, 8-11, 11-5, 9-11, 11-6, 11-5). Success for Wang Manyu, one day earlier alongside Sun Yingsha there had also been women’s doubles success; the no.2 seeds, the duo accounted for compatriots and qualifiers Ding Ning and Wang Yidi (12-14, 16-14, 11-6, 11-13, 11-4) to secure the top step of the podium. Significantly one round earlier, Ding Ning and Wang Yidi had ended the hopes of Japan’s top seeded Hina Hayata and Mima Ito (11-9, 11-5, 11-5). Hard fought success for Wang Manyu and Sun Yingsha; in the mixed doubles, Xu Xin and Liu Shiwen, the no.5 seeds, proved a step ahead of the field. Never troubled en route to the final, it was the same in the final. They accounted for reigning Japanese national champions, Masataka Morizono and Mima Ito in straight games (11-5, 11-7, 11-7) to secure the top prize. Four titles, the one event to elude Chinese hands was in the men’s doubles; the no.7 seeds, Lin Gaoyuan and Ma Long suffered a quarter-final defeat at the hands of Korea Republic’s Jeoung Youngsik and Lee Sangsu, the top seeds (11-7, 11-8, 11-8). One round later they departed at the hands of the champions elect, Ho Kwan Kit and Wong Chun Ting (11-6, 9-11, 11-7, 8-11, 12-10). 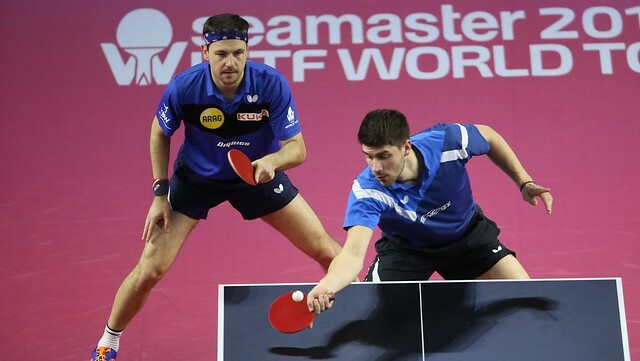 A place in the final secured, the chance was taken; Ho Kwan Kit and Wong Chun Ting, the no.3 seeds, accounted for German qualifiers Timo Boll and Patrick Franziska (11-4, 7-11, 11-9, 11-9) to secure the top prize. Play concluded, defending champions at the forthcoming Liebherr 2019 World Championships, Ma Long answered any questions, Ding Ning has questions to answer; meanwhile, Wang Manyu sounded a warning, China made intentions clear, crystal clear. Winning combination in Doha, good omen for Budapest?